Use as a finish on different surfaces (stone, concrete, plaster, metal, wood). 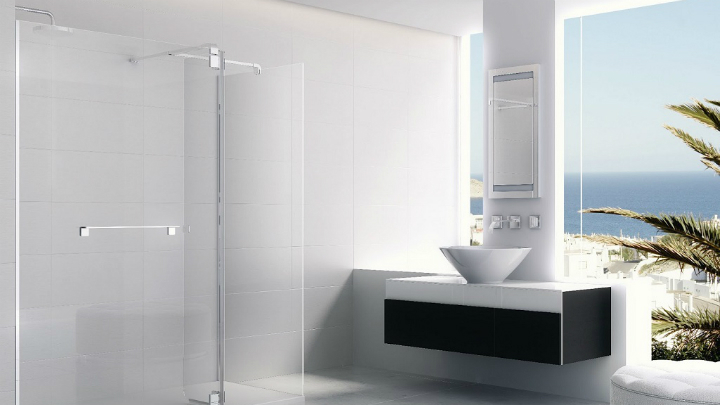 The mosaic is ahead of ceramic tile in durability and strength, and also provides an unlimited number of options in terms of the decorative design of bathrooms, combined with any materials and interior styles. 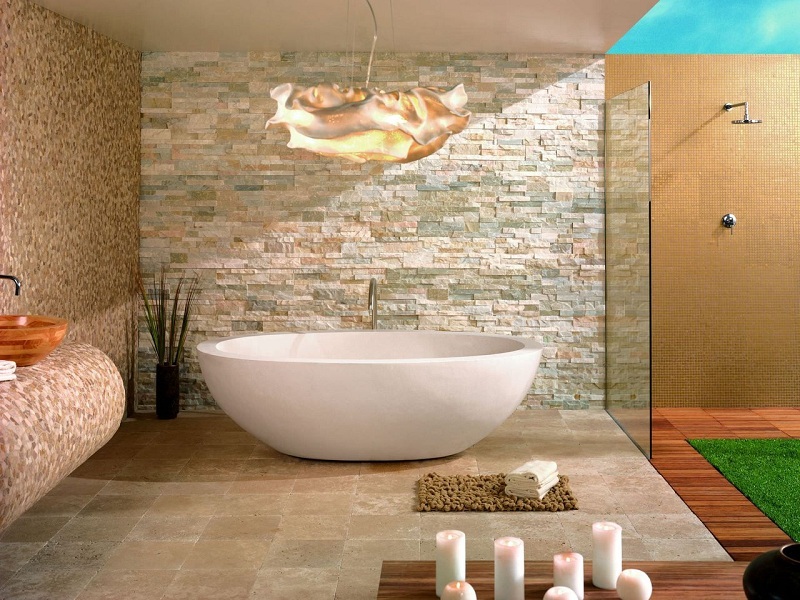 from natural stone (most often it is onyx, travertine, tuff, marble, jasper, granite, aventurine), each variety has unique shades and textures, the material is most durable and durable, looks luxurious and costs accordingly. Each type of decorative mosaic has a working label. Some varieties are suitable only for walls or ceilings, others – for dry areas, and others – for the floor (with a non-slip surface). In addition to an abundance of colors in the range are facing materials with different textures: mirror, pearl, matte, glossy, artificially aged, with a metallic sheen, gold, and silver, bronze. On sale, there is a mosaic of different shapes: in the form of classic squares, stones, and pebbles, rectangles, rhombuses, lace figures, circles, hexagons, as in the photo below. You can purchase ready-made finishing materials in bulk (such mosaics make up luxurious, expensive panels, it is ideal for creating exclusive interiors, drawings, patterns), in the form of blocks with a specific pattern or flexible rolls. Blocks are also called mosaic tiles or pseudo-mosaic; they are composed and combined like pieces of a puzzle. Flexible mosaic on a grid or paper base is ideal for designing curved surfaces, rounded bends (as in the photo), niches, and plumbing. 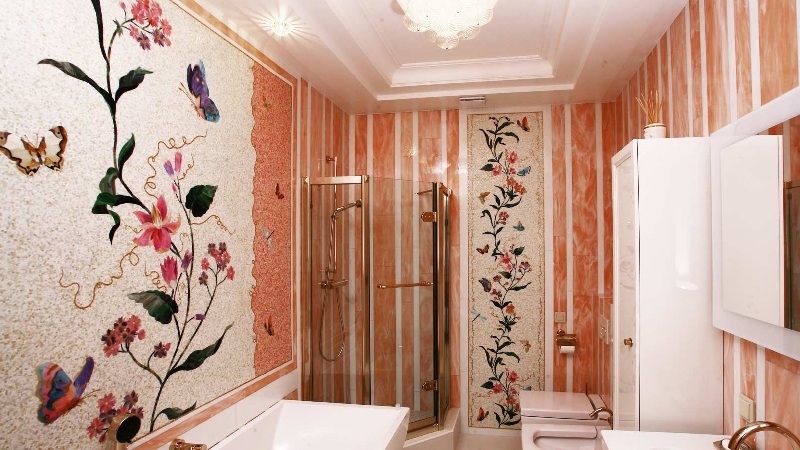 Mosaic in the interior of the bathroom works wonders if a talented designer and equally experienced craftsmen join the business. It is possible to use this material on any surfaces; it is dosed also on the big areas, combining with other types of finishing and different styles. In any case, the costs will pay off: your bathroom will look spectacular and unbanal, and the decoration itself will last for many years. 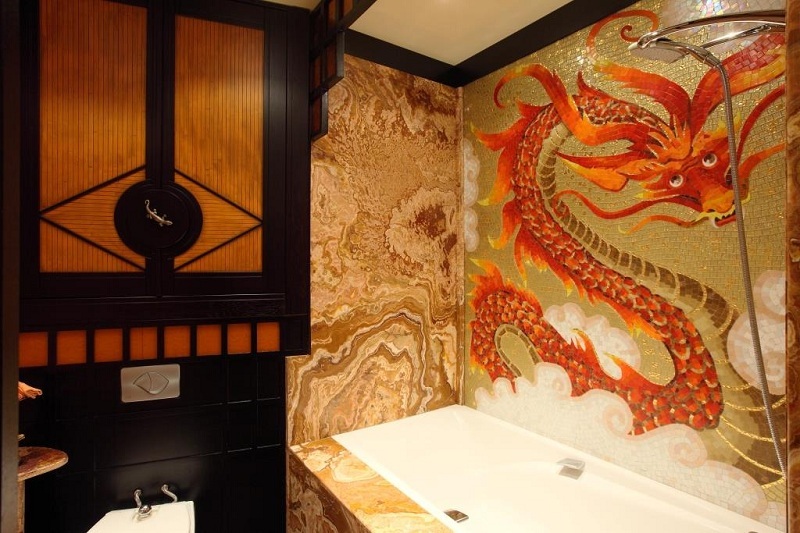 Mosaic can be used for cladding the floor, walls, ceiling entirely or partially. The premises, fully decorated with mosaics, look luxurious and invariably cause admiration. In small rooms, it is customary to use light and pastel shades, for large rooms the range of finishing material is unlimited. If a fully tiled floor does not fit into your budget or the idea of ​​a perfect bathroom, use the finish only in the wet area: around the bathtub, sink, in the shower tray, for decorating the podium or steps under the bath. You can zone the room with the help of color flooring; no less impressive is the “carpet”, laid out of a mosaic on a light background tile or tile, as in the photo. 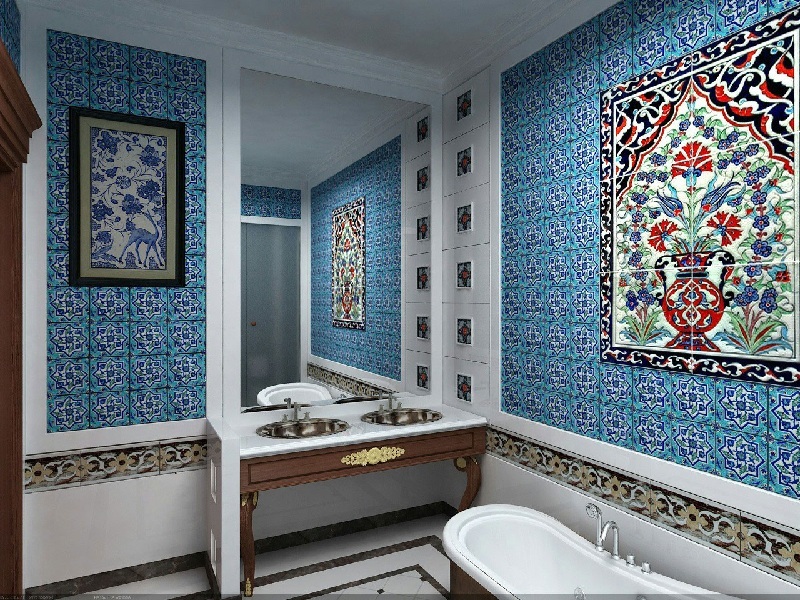 The mosaic fits perfectly into the interior of complex rooms with niches, columns, grooves, numerous corners. For example, having decorated with a bright or neutral mosaic shade two-thirds of the height of the walls around the bathroom perimeter, you can combine all these projections and corners, give the room a harmonious look. If niche shelves are made in the bath area, they can also be laid out with mosaic, as well as the partition separating the shower, toilet or bath from the rest of the space. No less effectively, this finish works in rooms with a sloping ceiling and irregular geometry, which are often found in the attic. 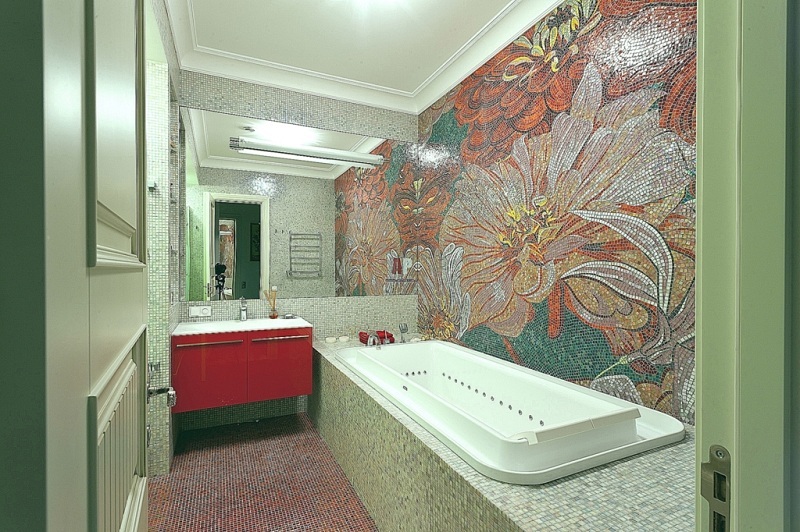 Mosaic decor can focus not only on the walls and the floor but also on the plumbing. So, you can lay out the podium with beautiful small tiles and decorate the bath screen, revet it completely, emphasize the area around the sink, mirrors with lamps, and the tabletop. The light, neutral background of ordinary or decorative plaster, ceramic tiles or even wallpaper will enhance the effect. 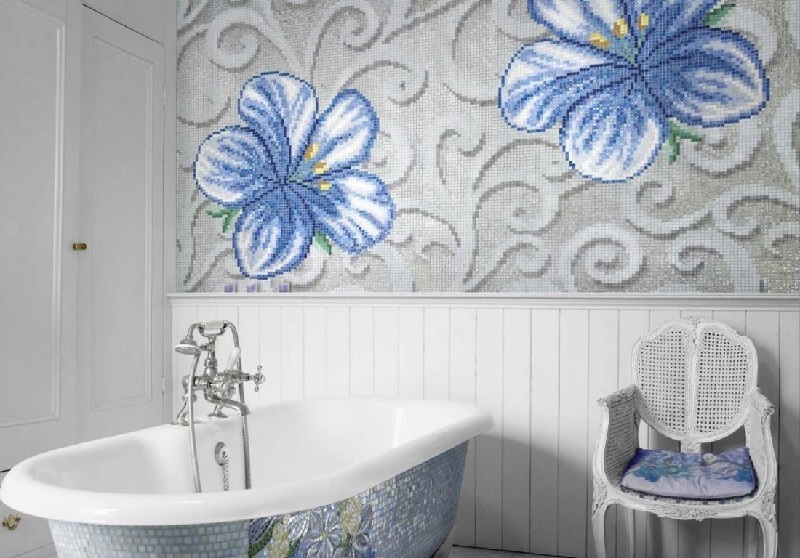 If you do not like sharp corners and your bathroom, including plumbing, is replete with rounded shapes and curved planes, the mosaic decoration is an ideal material to demonstrate the beauty of the designer’s idea. The design of the mosaic bathroom evokes associations with colorful panels made up of tiny pieces of the same shape. Typed picture from loose mosaic is a work of art. Such a pleasure is not cheap, but it is made in an exclusive version and fully corresponds to the tastes of the customer, the color scheme and the style of the interior. There are also panels from whole pieces of a mosaic, various patterns, even inscriptions and slogans on sale. Sea themes (landscapes, images of sailing ships, inhabitants of the seas and oceans, fairy-tale creatures), variations on ancient themes, flowers, abstraction are most often used as themes for mosaic panels. The panel can be located on one wall or its section, or occupy the entire surface of the walls and even the ceiling. The use of matrix mosaic allows you to create a picture of the same shape and size of the pieces. Chipped mosaic of fragments of different colors, shapes, and sizes fit in the Roman technique, such panels look unusual, spectacular and require special skills and experience from the master. Patterns can be any, from fashionable Moroccan ornament to floral motifs. The so-called pixel pattern using mosaic pieces of related or contrasting shades of 2-3 colors is popular. Since mosaic decoration is a rather expensive budget item, it is often used in detail to emphasize, to focus on a certain section, several zones, and interior elements. 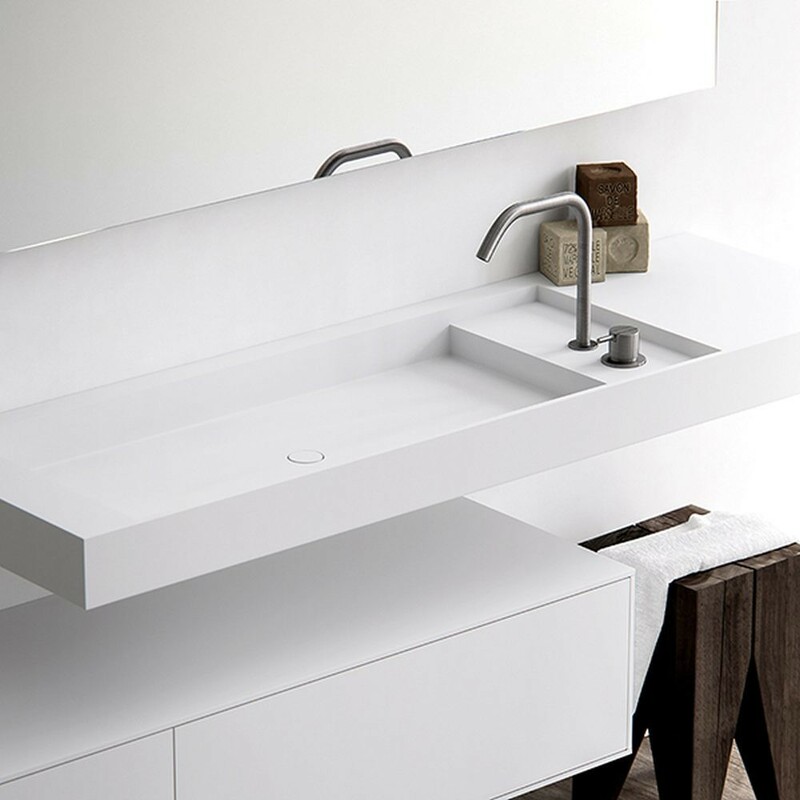 For example, you can select a piece of the wall above the sink, countertop, bath screen, area behind the illuminated mirror, a wet area around the bath or in the shower with a bright or metalized mosaic; wall. 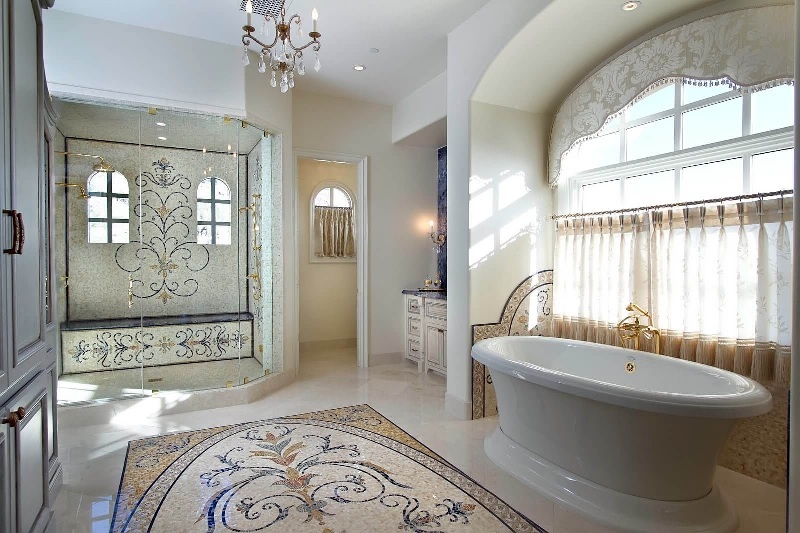 Mosaic in the design of the bathroom is perfectly combined with other materials. So, mosaic finish is often combined with white or pastel paint on walls, parquet on the floor, tiled and ceramic tiles, including ones that mimic natural stone (marble, granite). 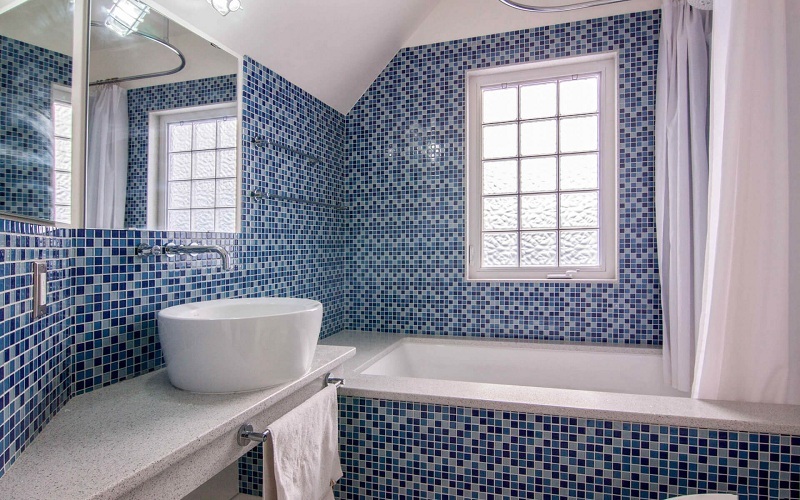 The combination of a blue or azure mosaic with a pebble coating in the bath zone looks beautiful, while small sections, columns, and corners lined with colored mosaics are combined with concrete, wallpaper, and decorative plaster. 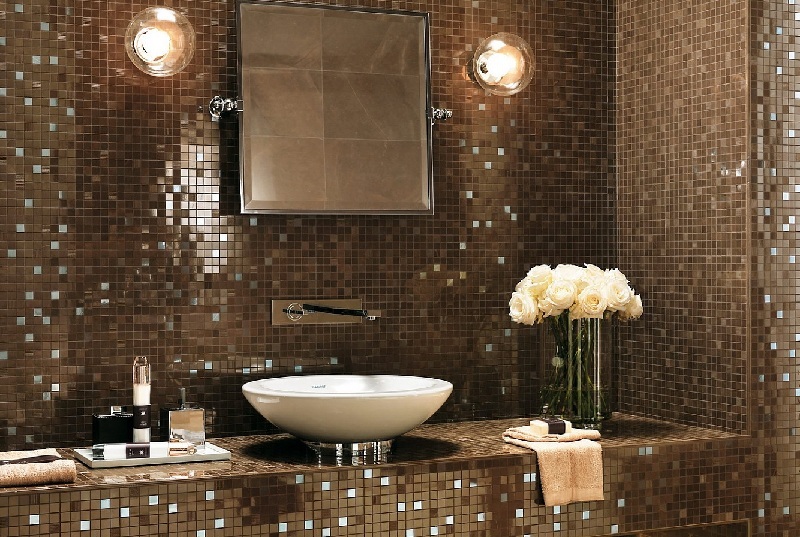 A light mosaic made of natural stone or imitating it will fit into the interior of the bathroom in a classic style. 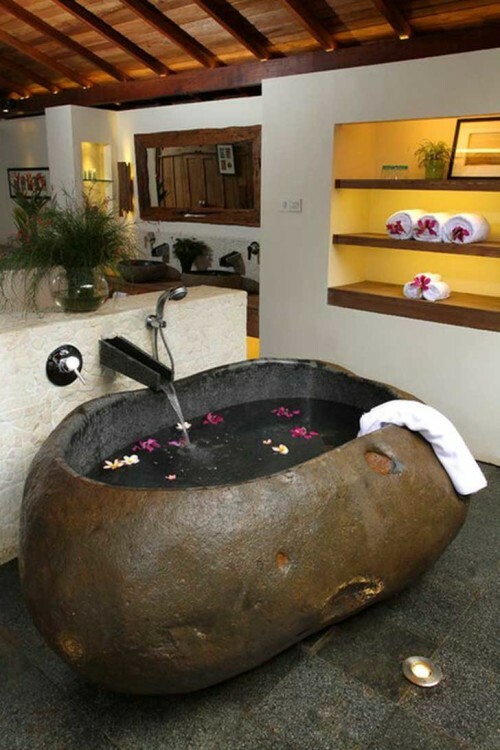 Eco, rustic styles involve the use of natural materials (glass, stone) and woodcuts, plants with large green leaves. In this case, it is not recommended to use mosaic panels and bright ornaments, as they will conflict with large plants. For Greek, antique style, designer’s advice using mosaic with characteristic ornaments, scenes from myths, light and natural shades (pastel, ocher, terracotta). Black mosaic with glitter, mirror effect, gold, silver patterns on a dark background will emphasize the beauty and sophistication of the bathroom in the Art Nouveau style, Art Nouveau, in the east key, as in the photo below. Azure, blue, white, lime shades, nacre patches are suitable for any bathroom, regardless of size, for design in a maritime, modern style. 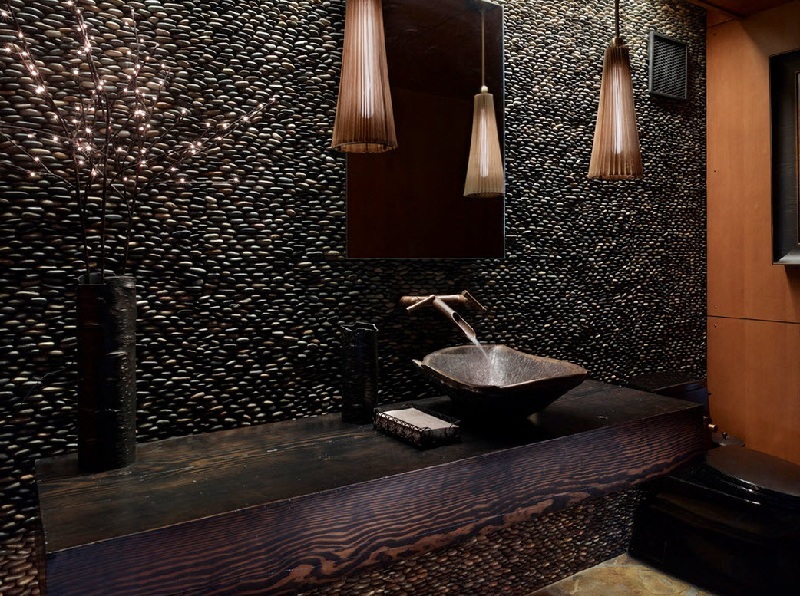 Brutal high-tech accepts black mosaic walls with metalized inserts, and bright maroon, rich purple tones are recommended to be used in small areas, softening them with light, coffee, golden colors of walls, floor, and snow-white fixtures. The use of mosaic in the decoration allows you to create a beautiful, durable, unique and spectacular design of the bathroom in any style. Even with a limited budget, thanks to fantasy and a sense of taste, you can achieve amazing results, and the photo from our selection is a clear confirmation of this.